Advantages of a Credit Card Associated With Your Wedding - Sonal J. Shah Event Consultants, LLC. Keeping your wedding expenses separate from all other expenses is a great organizational way to start off the planning process. Not only does is give you the organization that is most certainly needed in helping you smoothly and effectively orchestrate your wedding day and all of the details that go into it, you also will earn rewards! Most chain hotels offer a credit card option in which you will earn points, free stays, and more. Marriott is one of the many hotels that offer this wonderful option. Below is a list of the rewards that would be awarded to you if you were to open a credit card with them. A few other hotels that offer this are Hilton and Hyatt. Earn 40,000 HHonors Bonus Points when you spend US $750 within the first 90 days of Cardmembership. Earn 6 HHonors Bonus Points for every U.S. dollar charged at participating properties within the Hilton Worldwide portfolio. Earn 6 HHonors Bonus Points for every U.S. dollar charged in the following everyday spend categories: grocery stores, drugstores, gas stations, home and wireless phone, cable and satellite TV, and Internet service providers (less returns). Earn 3 HHonors Bonus Points for every U.S. dollar charged for all other purchases anywhere American Express Cards are accepted (less returns). Online booking bonus: 500 HHonors Bonus Points every time you book your stay through a Hilton Worldwide website and charge it to your Hilton HHonors Card from American Express. Upgrade to Hilton HHonors Gold status for one year when you make eligible charges of $20,000 or more annually to your Card. 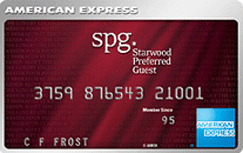 Enjoy automatic enrollment in the Starwood Preferred Guest® program. St. Regis®, The Luxury Collection®, W® Hotels, Le Meridien®, Westin®, Sheraton®, AloftSM, ElementSM, and Four Points® by Sheraton. Start redeeming with as few as 1,500 Starpoints for free nights with a combination of Cash & Points. Use Starpoints for free nights any day of the year, even holidays. Enjoy your fifth night free and up to $100 in resort credit at participating resorts in Hawaii and French Polynesia.